Softshell pants are unconquerable when it comes to pants for active women who value comfort. Most softshell pants are somewhat loose-fitting, without being overly capacious. Many also have some stretch in them for comfortable freedom of movement when you climb, hike or run. The best pants are breathable to prohibit overheating during strenuous activity. 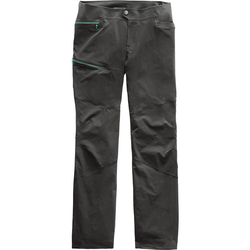 Some softshell pants also repel water to keep wearers dry during rainy conditions. Many softshell pants come in neutral greys and blacks, but they are also available in other colors, such as green and red. Top-of-the-line women's softshell brands include The North Face, Marmot, Oakley, Mountain Hardwear, Outdoor Research and Patagonia.